Thinker, feiner, soldier ... Spy? John Turi, author of England's Greatest Spy: Eamon de Valera, described as a former US Naval Intelligence Officer, has already achieved one remarkable outcome with his book (published on Monday). He has made of me a de Valera defender! I put down the book with a feeling of fervent hope that people like Turi are not currently employed in supplying intelligence reports to the White House which could influence President Barack Obama's Afghanistan policy. Turi's thesis is that de Valera was turned by one Major Price, a British intelligence officer, after his nervous breakdown during the 1916 fighting and in return for being spared from execution he agreed to become a British spy! 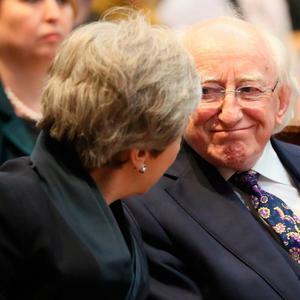 Turi says that everything he did thereafter was at the behest of the British: "..every single, major decision of his more than 50-year career benefited England to the detriment of Ireland". What a massive and lasting feat of brainwashing to have achieved in a few days! Turi argues that de Valera remained under British influence even while out of their reach for 18 months in America circa 1919-20. Some may have thought that de Valera's rejection of the Treaty which the British government of the time clearly favoured rather invalidates Turi's opinion. His book creates a particular problem for me. Firstly, he says that while I researched "meticulously" for my biography of de Valera, I failed to "recognise the conspiracy and the traitor". My myopia was apparently caused by the fact that I was trying to appease those who venerated de Valera! As it is a well-established fact that anyone who has read my book found therein nothing of appeasement and much of criticism I will not dwell further on this fanciful opinion. What does concern me is the fact that having accused me of appeasement Turi goes on to make extensive use of quotations from my book to bolster his case, using as many as 15 references in one chapter alone. This selective use of quotations, an occupational hazard for historians, contributes not to truth but to bad history. For example in his film Michael Collins, Neil Jordan, quoted from my biography of Collins this (previously unpublished) statement of de Valera's: "It is my considered opinion that in the fullness of time history will record the greatness of Collins and it will be recorded at my expense." De Valera uttered those words in 1966 in the course of rejecting a suggestion by Joseph McGrath that he should help in the creation of a Michael Collins scholarship. But Jordan used the quotation as a voiceover for a shot of Alan Rickman, who played de Valera, apparently conniving in the assassination of Collins in Beal na Blath 44 years earlier in 1922. In fact, as I pointed out in my book, de Valera opposed the ambush, tried to have it called off and was not present when it occurred. The ending of the Jordan film gives a completely misleading impression of what happened. Swinging the pendulum of distortion in one direction, apart from being wrong in itself, only entices others to swing it in the opposite direction. Take for example Diarmaid Ferriter's lollipop, Judging Dev, which painted de Valera in such roseate hues as to cause copies of the book to be placed in every secondary school in the country under the reign of Fianna Fail education minister, Mary Hanafin. The reason for this placement, according to Ferriter in a letter to the Irish Times, was not his adulatory portrait of "The Chief" but the fact that his book appealed to the Department of Education because it was based on historical documents! And there was me thinking that all history books relied on historical documents! However, back to Turi and his diseased clarity of vision. He says of de Valera: "From the day he was born till the day he died de Valera's life was a mountain of lies, half-truths, innuendoes, abandonment, rejection, deceit, betrayal, treachery , and even murder." Clearly that assessment will literally not get Mr Turi into La Hanafin's good books; but even if one accepted all of it, it does not make Eamon de Valera a British spy and it does prove that Turi views him with loathing. I believe that de Valera was a gifted but deeply conflicted man, a combination of a nice guy and a man of power who opted for power over niceness every time; his character shaped by a loveless upbringing and his illegitimacy, a crown of thorns in the Ireland of his time. I also believe that Professor Michael Fitzgerald, one of the country's foremost psychiatrists, was correct in diagnosing de Valera as suffering from Asperger's Syndrome -- a finding which Dr Ferriter dismissed, with the full benefit of his own inexperience in the field, as mere "psycho-babble". But I have never found a scrap of evidence to support the contention that Eamon de Valera was a British spy and Turi has not produced any either.